Okay, it is pretty much impossible to eat well for under $10.00 at any theme park. 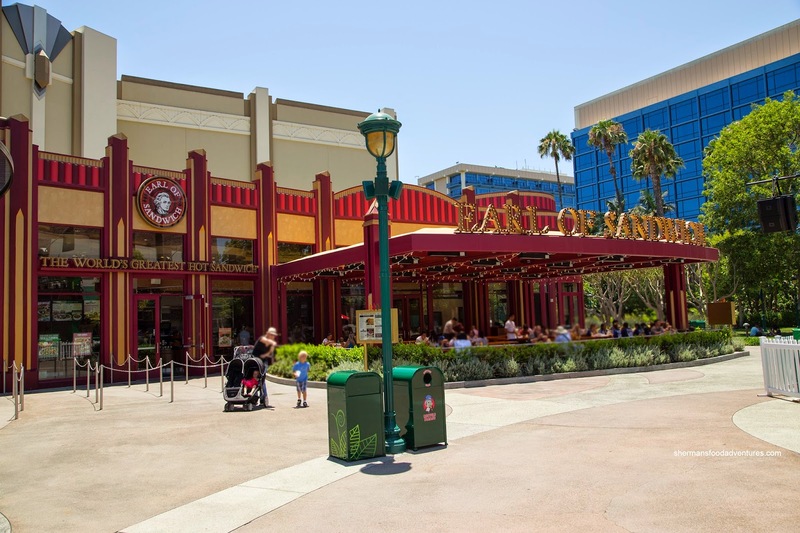 Take a look at Disneyland where a hot dog and chips will set you back $8.00. And we're not talking about a jumbo dog either. Unless you want to live on smoked turkey legs for the whole time, your wallet will be a lot lighter while your stomach might hate you for consuming food only in the shade of golden brown. 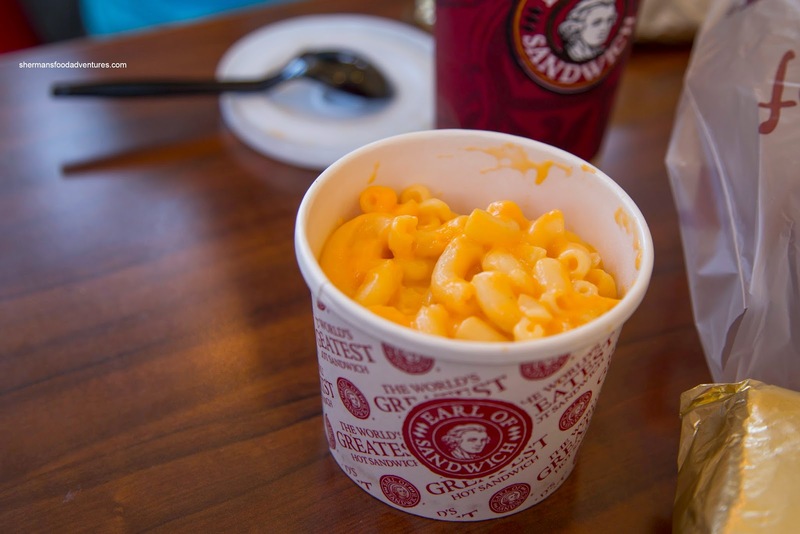 However, we had a decently inexpensive meal at Earl of Sandwich at Downtown Disney at Disneyworld last year. Hence, we took a page out of that playbook and paid their location at Disneyland a visit. 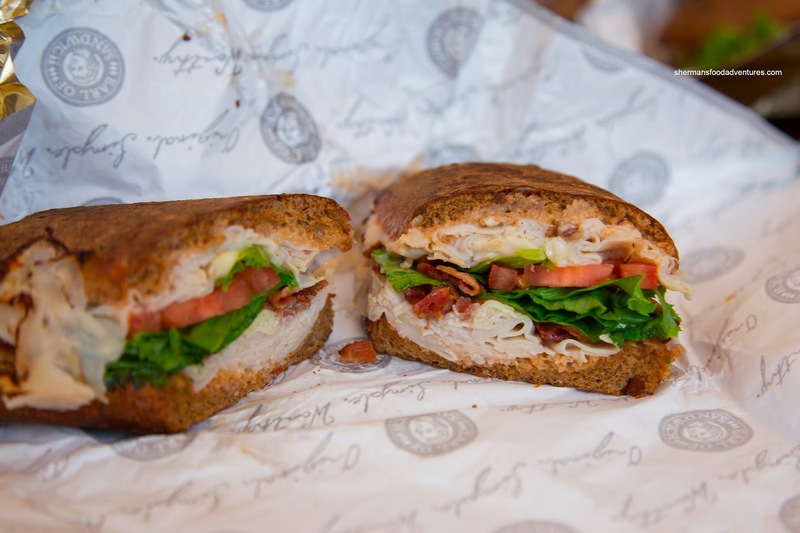 Like last time, we got the Earl's Club with turkey, bacon, Swiss, sandwich sauce, lettuce and tomato. Of course, my son conveniently offered up the lettuce and tomato up for grabs. I'm not sure if there is a vegetable that he actually likes. Nicely toasted, the whole wheat bread held up to the ingredients without being overly dense. There was ample filling including a healthy portion of thinly sliced turkey along with crispy bacon. For myself, I went for the Italian consisting of salami, capicola, roasted ham, mortadella, mozzarella, tomato and Italian dressing. This was a zesty combination of meats which were salty, sweet and spicy. The tang from the dressing was a nice compliment, yet made the sandwich a bit wet and drippy. Viv decided on the Holiday Turkey, but unlike the last time, it was totally devoid of gravy and stuffing. Instead, there was double the amount of turkey (which wasn't necessarily a bad thing|) and cranberry sauce. 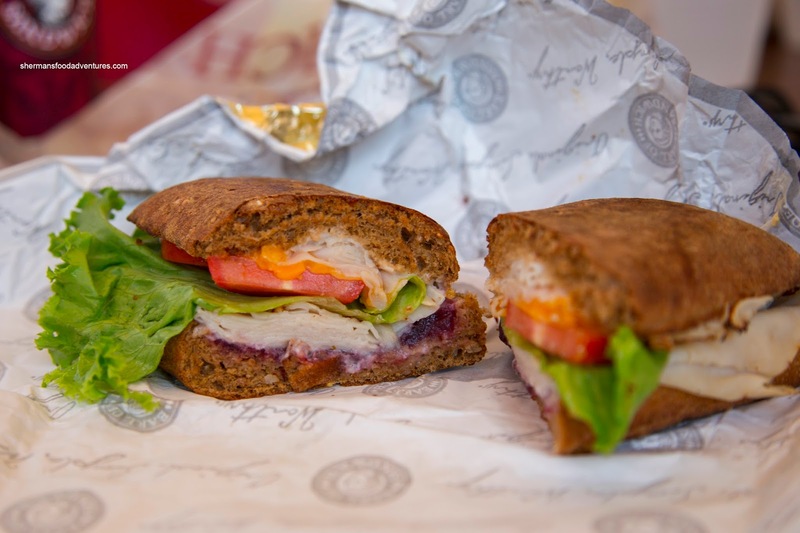 Hence, the whole thing was essentially a turkey sandwich with the addition of sweetness. We were pretty sure they screwed this up. Elaine ended up with the Chipotle Chicken Avocado consisting of grilled chicken, bacon, cheddar, avocado, lettuce and chipotle sauce. This was pretty tasty with an effective spiciness from the sauce. 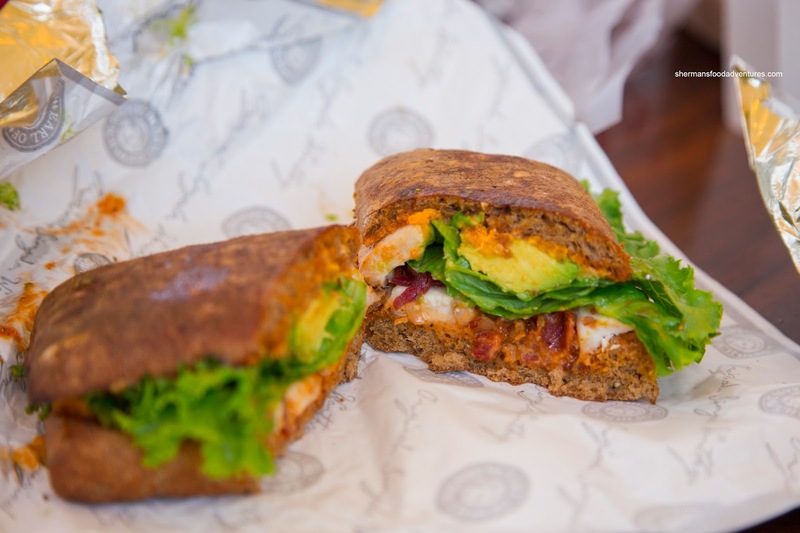 The ample chicken was sufficiently moist while the avocado added a smooth creaminess to go with the crispy bacon. And for heaven's sake, Elaine's son didn't stick with the program and opted for the Mac n' Cheese... This at a sandwich shop? And I thought my son was a picky eater! Anyways, it was okay with soft noodles in a creamy sauce that wasn't necessarily all that cheesy. But it did the job for him... Hey didn't he just have this the day before??? 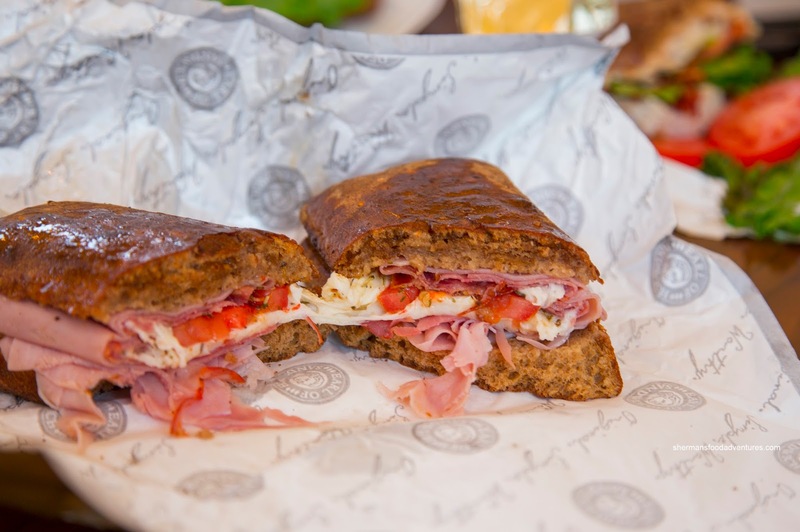 Well, if we focus on the sandwiches only, Earl of Sandwich does it right and for a reasonable price. Basically it was a good break from all the crappy expensive theme park food.